Rolling into week 8 I am so thrilled to see progress…FINALLY! Oh, we’ve done a lot but nothing feels as good as seeing a room come together! This week I was the painting queen. It was only one room but when you consider I was priming previously stained and polyurethaned trim, you realize quickly that it takes time. Lots of time. Coupled with new ceiling texture and two coats of paint on the walls, I think I’m ready to go back to sanding drywall this weekend. The end result will be a fresh new room for my son to occupy and guests to use when they come for a visit. It may be mind numbing neutral in color but this time (I swear) I’m using ONLY the color palette book I chose from Dutchboy. 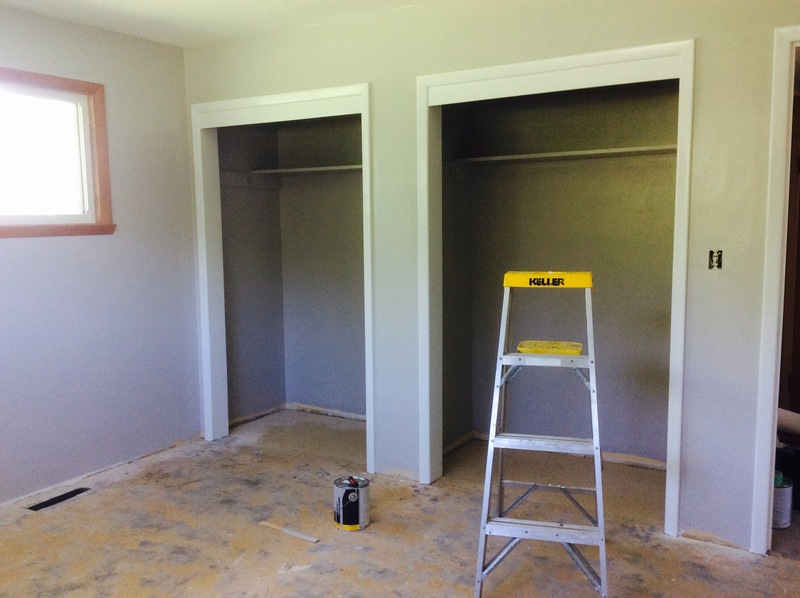 This room is Misted Silver on the walls and Sultry Gray in the closets. I may end up getting a wild hair and find a good accent color to use on a particular 1/2 bath barn door or the kitchen island. The important point I’m trying to make is that I refuse to go all Rainbow Brite on the walls. I have a weakness for random pretty colors and they don’t always work out. The contractors have been hard at work this week and that seems to have enhanced the feeling of overall progress. 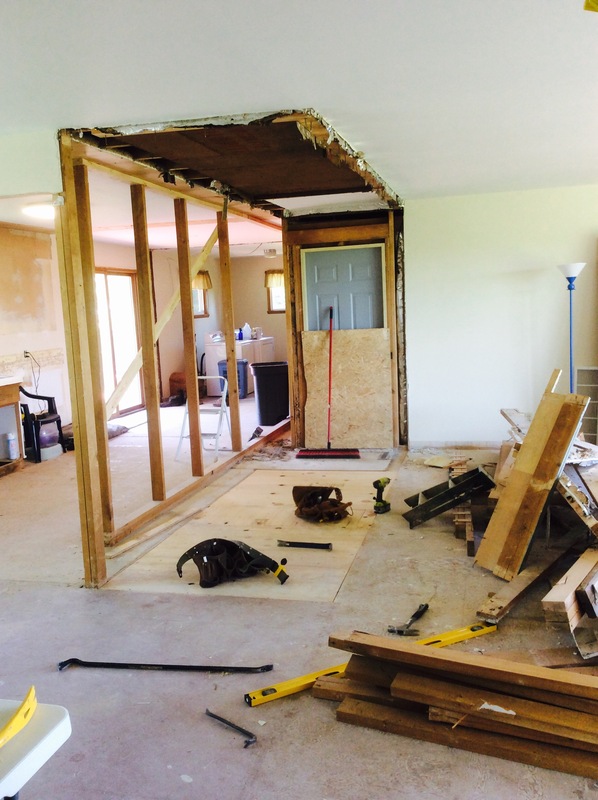 Our stairs have been relocated and the kitchen is in the process of being opened to the living space. Viola! 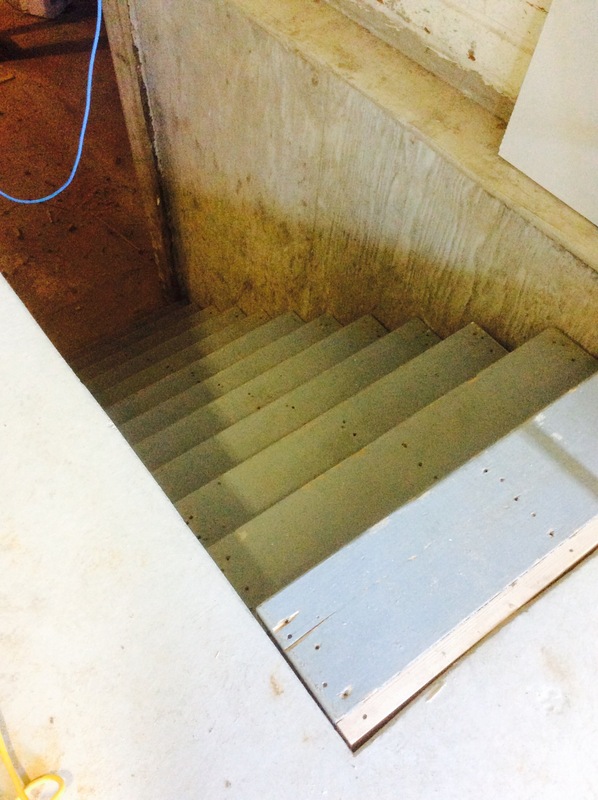 The stairs are moved! The end result will allow us to move full steam ahead with many other projects. Electrical wiring and lighting will be a large part of our prep work as we texture more ceilings and paint more walls. Somewhere in the midst of this, the bedrooms will finally get their carpet! Meanwhile, our dirt is still growing some wonderful looking plants. 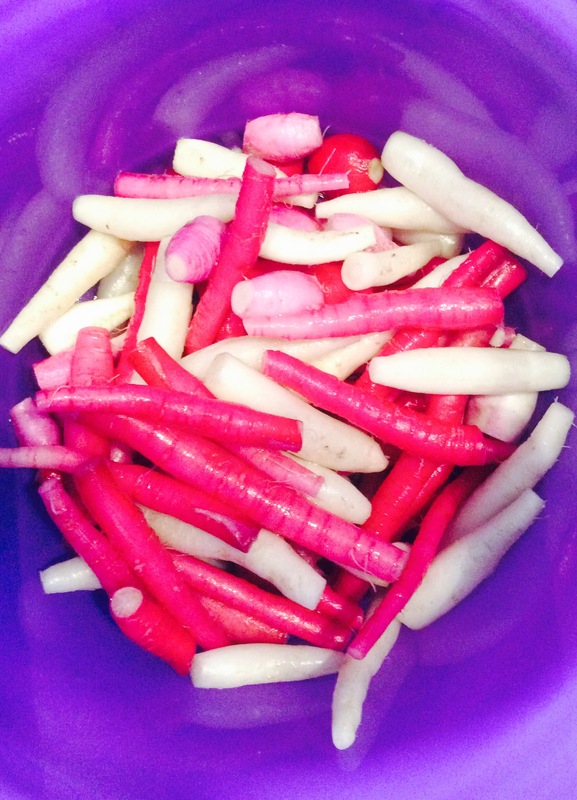 This week I was able to finally harvest some radishes. They ended up being pretty spicy due to the hot weather but I was glad to get them none the less. The ducks were very interested in seeing the garden activities too! They tried their beaks at some fresh radish greens and seemed to love them. Every so often I hear a random adolescent squawk as they are developing their quacks. It reminds me a bit of boys going through puberty and it makes me chuckle to see their personalities grow and form. So much has happened on our little farm in the past two months. I have a hard time believing we’ve been here that long! As frustrated and as tired as we all get, I think I can speak for both Jeff and myself, we love it here! Onward into Week 8 we go!